Yusei Kikuchi…resides in Tokyo, Japan with wife, Rumi…Rumi previously worked as a broadcaster for NHK TV…pitched for Hanamaki Higashi High School in Japan, where he led the team to to a runner-up finish at the national high school invitational in April 2009 and to the semifinals in the national championship in August 2009 before being the top pick in the 2009 NPB Draft…made his pro debut for Seibu's minor league team in 2011 and also pitched with Melbourne in the Australian Winter League that year. The Totals - Went 14-4 with a 3.08 ERA (56 ER, 163.2 IP) with 153 strikeouts and 45 walks in 23 starts with the Seibu Lions...Sky Full of Stars - Named to the NPB All-Star Team for the 3rd time in his career (also: 2013 and 2017)...Winning Ways - Earned double-digit wins (14) for the 3rd consecutive season, following 12 wins in 2016 and a league-best 16 wins in 2017...You Complete Me - Tossed 1 complete game. 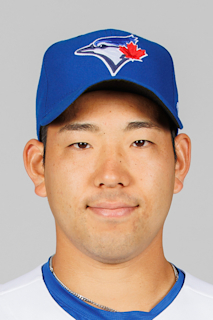 January 2, 2019 Seattle Mariners signed free agent LHP Yusei Kikuchi.